Set against the backdrop of the Waterhouse building, the Ice Rink at the Natural History Museum is one of the most magical places to be this winter. Experience the thrill of skating surrounded by fairy lights nestled in frost-covered trees, with the smell of mulled wine and toasted marshmallows in the air. Whether you can dance on ice like Torvill and Dean, or you skate more like Bambi, a visit to the Museum’s Ice Rink is a must this festive season. Only general skating tickets available. 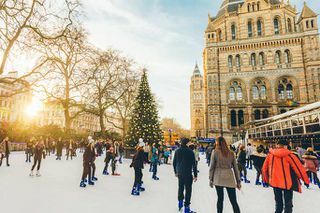 The Ice Rink is an outdoor event and operates in nearly all weather conditions. However, please bring suitable outdoor clothing whatever the weather. Ice is, of course, made from water - rain or dry there is always a risk of getting wet. In the unlikely event that the Ice Rink must close, alternative skating sessions will be offered. We regret than no refunds can be given due to bad weather. Please exchange your voucher upon arrival for entry. The Ice Rink will be open 20 minutes before the first session. For all other sessions please arrive a minimum of 40 minutes before the start of your session.